A professional close-up magician working in and around Norwich. I provide top-notch entertainment at price levels that don't break the bank. "Imagine the excitement on your guests' faces as they ponder in amazement at the seemingly impossible event they just witnessed. This event is then followed by a series of even more impressive feats. So impressive in fact that you won't be able to stop them talking about the fantastic experience you provided by Alan Nunn." 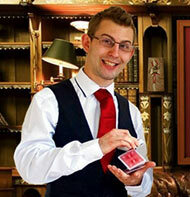 Steve Crystal is a children's magician and illusionist and has differing shows tailored to the age of the children. Every illusion, effect and gag has been thoroughly tested on his two greatest critics, his own children aged 5 & 8. Steve is constantly practicing new effects for his shows but also includes some all time classics including the appearance of live goldfish as well as the star of the show "Harvey" the magic rabbit.